It’s been a while since I posted new projects into my blog. I was really busy working and writing, as I am a copywriter. But I had some time to craft, too. Here is one of my little glass decoupage projects. I have to admit that I have found this bottle somewhere on the lake bank. I live in a beautiful neighbourhood, but some people make this place a mess. I picked this bottle up and decided to make something special out of it. The bottle is good, because it does not get turned over easily; it has a wide bottom. So, I decided to turn it into a candle holder. We need one because the do turn the lights off once in a while. BTW, I have found another similar bottle, but a bit smaller in size and I’ll make another candle holder out of it to match this one. First, as usual I have painted the bottle with white acrylic paint. 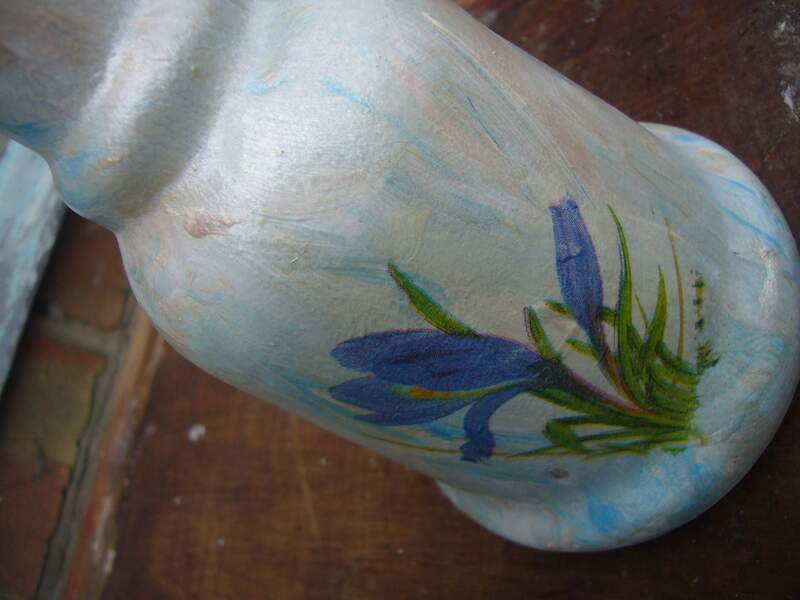 Then I added some blue shade into it and painted the bottle using a brush. I make upward strokes to add different colors and texture to the bottle. Finally I decoupaged it with spring flowers and covered with transparent polish. It’s a ten min project, if you use hairdryer to speed up the drying processes. But it looks nice. I have managed to turn a piece of trash into something useful and good-looking! Pin it, if you like it! This entry was posted in Decoupage ideas, Go green and tagged bottle recycling project, decoupage on glass, DIY decoupage, glass bottle decoupage, glass bottle into candle holder. Bookmark the permalink.